and eliminate those pesky calls once and for all ! As a business owner you’re no doubt tired of receiving those annoying robot phone calls from so-called certified Google experts claiming that you need to ‘verify’ (claim) your business before someone else does?… Nonsense, it’s time to fix this by setting up your very own correct account with Google, thus eliminating those pesky phone spammers from trying to corner you into unnecessary fees. The easiest way to set-up your Google My Business account is to first establish a Google Gmail account… this essentially will become a central location to capture all of your communications with Google. You’ll also find [this] your Gmail account to be very helpful to monitor all other Google business related activity, eg., Google Plus, Google Analytics, et. al. First, try to find your listing online by using Google Search by entering your business website domain. Look for a business location graphic (like the image below)… and be sure to have your Gmail account (as noted above) ‘opened’ prior to doing this search. If you’ve been an established business for some time you’ll discover that you’re already in the search results. Once you locate this image look for the anchor text with the words… “Own this business?” – or – “Verify this business” – or -“Manage this page” (predicated on how old your website is). However, if you are a recent business and can’t locate your Google Business Location Image, then you’ll want to establish your ‘correct’ address in your Google My Biz account directly. The first thing you’ll be asked when you start a new/recent business in Google My Business is what type of business do you offer… eg., Store, Service or Brand. Essentially, if you are a fixed brick and mortar type, select ‘Store’. If you deliver or offer a service away from your brick and mortar (eg., plumber, pizza delivery, etc.) then select ‘Service’ and, if you’re promoting a strong ‘Brand’, select such. Note: If you see ‘2’ (identical) businesses in your Google My Business (GMB) account, only verify ‘1’ location… Sometimes it gets confusing because you might had started your business inside your GMB account only to find out you were listed with a Business Location Image in Search (noted above). Preferably, just ‘verify’ your Image in Search and otherwise do not request a verification for two of the same listings in GMB… it will confuse Google! Just let one of them sit idle (not verified)… it’s hard to delete just one of them, btw. If by phone ‘make sure’ that you use your actually business phone number. It’s also the phone that Google has on file for you to establish your Google My Biz account. 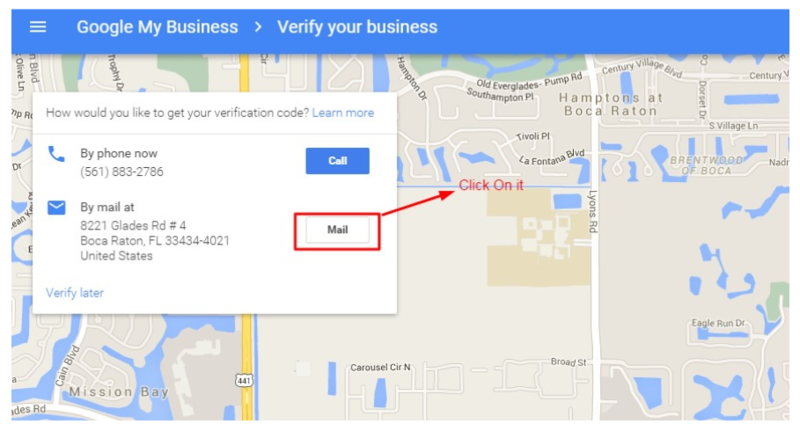 By phone, simply click the verify by phone and be ready for an immediate phone call from Google with an automated verification code (approximately a six digit #). Enter this PIN code into the appropriate box provided. If you choose to have a code mailed to you, expect it to be delivered to you within a week to ten days. Once you receive this post-card from Google go into your Google My Business account and enter where appropriate. Note: Remember that the address you use must be the same that you use establish with any other Google activity or any Directory Service you use, like…Yelp and Manta, et. al. You’ll eliminate those pesky calls once and for all ! Relevance… How well does your local listing match what someone is searching for? Distance… just like it sounds – how far is each potential search result from the location term used? Prominence… Referring to how well-known your business is online, eg., back-links from authority sites, articles, directory listings and social sharing. Want this done for you, or at least some free tips on how to do this yourself?